Another blissful childhood memory of mine is ‘Sinterklaas’ day and the traditional ‘speculaas’ that comes with it. A typical Belgian holiday favorite, this spiced dark brown cookie is the star behind the ‘Biscoff’ speculoos cookie butter (or Trader Joe’s cookie butter) you see appearing on more & more American grocery shelves nowadays. ‘Speculaas’, or speculoos with double ‘o’, is readily available in Belgian grocery stores year-round, but its national primetime is definitely on ‘Sinterklaas’ day! 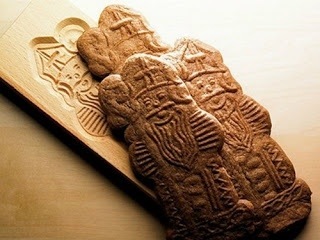 Many bakeries press this deliciously spiced cookie dough in special wooden ‘speculaas’ molds, to create various imprints and shapes of the cookie, often with depictions of Sinterklaas. Top of the line pastry boutiques and fine bakeries even create toddler life-size Sinterklaas statuettes, that adorn their elaborately decorated & animated store windows and are admired by passers-by for their artistry with a sense of wonder. ‘Sinterklaas’ day, celebrated on 06th December, is deeply rooted in Catholicism since the Middle Ages. It is traditionally a celebration of Saint Nikolaus, patron saint of sailors, among others. Legend has it that Saint Nikolaus, a Greek bishop from the city of Myrna in present day Turkey, would roam the lands alongside the Mediterranean Sea, to remind folks of their religious duties. It is said he would preach about good moral values and spread cheer among the sailors’ families & children. 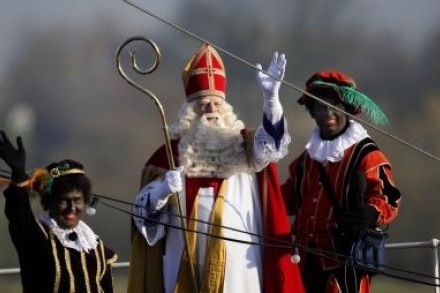 Sinterklaas festivities may seem insensitive to many Americans, but these traditional celebrations came long before they acquired any racial connotations later on in history. With the legend of Saint Nikolaus so deeply rooted in Catholicism and the religion’s pre-occupation with ‘good vs. evil’, the depiction of a ‘white’ holy man and his ‘black’ assistants has nothing to do with racial equality or differences… and everything to do with pitting good vs. evil. As such, Sinterklaas is depicted as a ‘good’ holy man, and his black assistants – Black Pete’s or ‘Zwarte Pieten’ – are meant to represent the ‘bad’ immoral influences we are tempted by. In that role, the ‘Zwarte Pieten’ are not meant to be depictions of actual humans, but rather portraited caricatures of frolicking, mischievous black devils that accompany the holy man to represent the evil influences that seemingly taunt us in our quest to be ‘good’. After all, if you were even remotely raised with deeply rooted religious beliefs, you have been warned a handful of times that the devil can take on any form to try and sway you from the ‘right’ path… Sinterklaas and Zwarte Piet truly are considered equals in the story, with each their own role to shine in, and the Black Pete’s form of dress is merely an accurate depiction of what men would wear during the medieval times in Moorish Spain, and not intended as mockery. 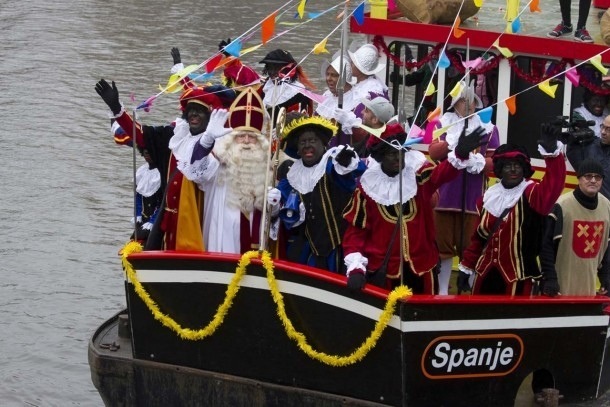 In present day Belgium, Sinterklaas still arrives by boat and many port cities will stage and broadcast his arrival over national & local media. In smaller towns, Sinterklaas rides the streets on a white horse and visits local schools, grocery stores and other public buildings. Just like Santa Claus, Sinterklaas makes house calls the night before, and parents urge their children to place a shoe by the hearth or the front door, so Sinterklaas can leave candy & goodies overnight. The importance of leaving a carrot or two for his beloved equine companion, is equally stressed! Throughout the year, parents cleverly use the whole Sinterklaas story to urge their children to be ‘good’, because being ‘naughty’ results in being whisked away to hell in Black Pete’s burlap sack. As a child, this was a credible threat that one could not take lightly! ‘Sinterklaas’ day was always fun. It broke the academic tediousness of school. You knew that anything could happen on this day, and you’d keep your eye out in giddy excitement for a glimpse of any of the Black Petes or a sign they were present. Many times, we’d hear the ruckus & screeching from a few classrooms down, and your heart would start racing with whirly anticipation of Sinterklaas’ arrival into your classroom. The first ones to arrive, were always the ‘Zwarte Pieten’. One would come barging through the door, throwing candy around and sending kids clambering all over their desks to get some, while another would mischievously start writing on the blackboard with blatant spelling errors and disregard for the scholarly establishment… Yet another would start emptying or rearranging book shelves or cabinets, or sit down next to you whilst mimicking your every move, much to the excitement of your peers. With Sinterklaas striding into class elegantly, almost royally, he’d immediately reprimand the shenanigans of his assistants, and inquire in class to spill the beans on what his assistants had been up to so far. Many children will eagerly blurt out everything from A-Z in hopes of pleasing Sinterklaas, much to the staged chagrin of the Pete in question, while others – like Teutonic little me – would feel there was no place for all of this frivolity until such time it was revealed who was on the ‘good’ list and who on the ‘naughty’ list. This was serious business, folks! Other than ‘speculaas’ and chocolate, Sinterklaas – said to be hailing from Spain – also brings mandarins, marzipan and ‘lieve vrouwtjes’ as well. Put everything in a ziplock baggy and shake well! Store in a small glass jar, in a cool dark place. Combine all ingredients into a large mixing bowl, and mix with a mixer or your hands until you get a smooth dough that doesn’t stick to your hands. Wrap dough ball in plastic foil, and rest dough in the fridge overnight to allow spices to develop flavor and permeate the dough. Preheat oven to 400F. Roll dough into a sausage, and slice into cookie slices. 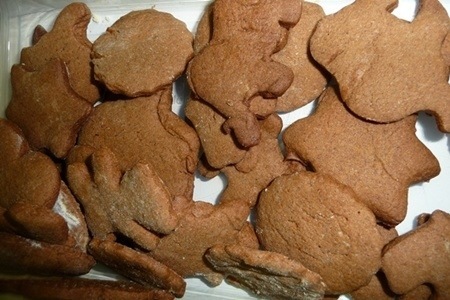 Alternatively, roll dough out on a floured surface, and use your cookie molds to cut out shapes. Place cookie dough on a parchment paper lined baking sheet, and bake for approx. 25-30 min. Allow cookies to cool and crisp. My family is Dutch and we LOVE Speculaas cookies. Luckily, we can find them at Aldi grocery stores in the states. I’ve thought about making them from scratch this year. These sound very simple. Hi Nicky! I’m glad you found this recipe. No Dutch or Belgian person should have to go without speculaas. I noticed Trader Joe’s is now selling them as well. Either way, speculaas is pretty simple to make… It’s all about the spices! Enjoy! Helga.